To see if Daisuke Sato is accepting new patients, or for assistance finding a UC Davis doctor, please call 800-2-UCDAVIS (800-282-3284). Theoretical and computational cardiology. Mathematical modeling of action potential and calcium cycling. Nonlinear dynamics of cardiac phenomena including alternans, early and delayed afterdepolarizations, Ca sparks, Ca waves. Sudden cardiac death is the leading cause of death in the United States. Our knowledge of sudden cardiac death is still limited. CAST (Cardiac Arrhythmia Suppression Trial) and SWORD (Survival With Oral d-Sotalol) clinical trials failed and tested drugs increased mortality. These single target drugs often cause unpredicted phenomena in the heart, which is the highly complex system. The complexities come from nonlinearities in the heart. The goal of my research is to understand how molecular level properties are linked to organ level phenomena using mathematical analysis and multiscale modeling of the heart. The goal of my research is to understand how molecular level properties are linked to organ level phenomena using mathematical analysis and multiscale modeling of the heart. 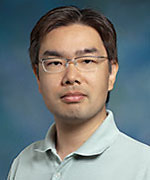 To view Dr. Sato's publications, please click here.